Hypothyroidism and high blood pressure diet. Hypothyroid is a condition in which the body produces insufficient thyroid hormone. Major causes of hypothyroidism include genetic, autoimmune disease, iodine deficiency, other medical condition or sometimes even over response to hyperthyroidism treatment. The thyroid hormone influences heartbeat, blood pressure and cholesterol levels. Thus low levels of thyroid hormone as in the case of hypothyroidism can in long run make your arteries less elastic and lead to increased blood pressure as well as slow down your heart rate. Hypertension caused due to an imbalance of thyroid hormone is termed as Secondary Hypertension. Hypothyroid also takes a toll on body weight. Since it leads to decreased metabolism, you tend to add on extra pounds. The excess fat deposits will further make managing blood pressure more difficult. The best resolution is diet and exercise to manage weight and control blood pressure both. Talk to your doctor and / or dietitian and pen down a plan which works the best with your medications to help you achieve this goal. This includes diet and exercise both. While these 2 won’t cure hypothyroidism, smart food and lifestyle choices will help you manage it better. 1. Side step all processed, fried, sugary and junk foods. 2. Dodge the goitrogens like soy and its products, cruciferous vegetables like cabbage, cauliflower, broccoli, kale and spinach and nuts like almonds, walnuts, cashews, peanuts, flax seeds and pine nuts. 3. Have iodized salt as iodine deficiency is one the cause of Hypothyroid. But don’t go overboard. Have just enough salt. Your dietitian is the best person to judge this. Depending on all the test reports s(he) would recommend a prescribed amount of salt per day that should suit you the best. 4. Include fruits like orange, apple, grapefruit, watermelon, papaya, guava, amla etc, while avoid peach, pear, strawberry, litchi and muskmelon. Turn to recipes like Minty Apple Salad and Watermelon and Apple Drink as nourishing options. 5. Go in for healthy cereals like quinoa, buckwheat and oats. Buckwheat Dhoklas, Baked Buckwheat Puri and Oats Nimki are some low fat recipe ideas which we have tried in our kitchen and shared the recipes for you. 6. Rely on proteins. They help boost metabolism. Prefer urad dal, chawli, moong dal, whole moong, rajma and matki as they have low potassium count than other pulses and dals. Try simple everyday delicacies like Khatta Urad Dal and Minty Bean Salad for lunch. 7. Eggs and low fat dairy would also be good choices. Avoid dairy if it doesn’t suit you. With eggs, you can experiment with a serving of Egg Paratha. If you have high cholesterol too, then it’s best to avoid the egg yolks. Prefer Fluffy Egg White Masala Omelette in that case. Also remember to not accompany these egg delights with any kind of bread, as it has a high salt content. 8. Avoid gluten from wheat, rye and barley if you are gluten sensitive. It is known that gluten intolerance caused due to an autoimmune response can increase the risk of another autoimmune disease like Hypothyroidism. 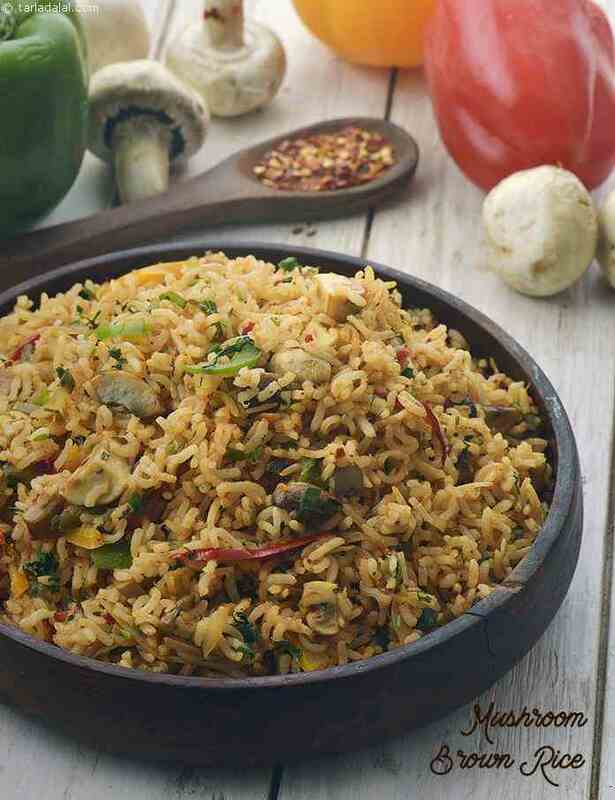 Try Low salt version of our Khichdi – Oats Moong Dal and Vegetable Khichdi. Ensure to use restricted amount of salt as mentioned in the recipe and follow portion size also. 9. Prefer not to opt for coffee, alcohol and ready-to-eat products. They don’t play well with thyroid. Prefer healthy soups like Nutritious Pumpkin Soup or you can even go in for healthy juices like Red Capsicum Carrot and Apple Juice…. these are definitely more healthier options. 10. Pep up your foods with fresh and dried herbs rather than calorie laden ingredients like we have done in the famous East Indian recipes – Bengali Style Veg Chops.